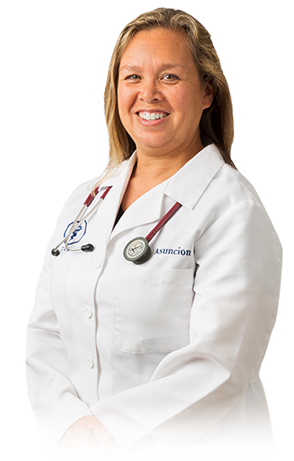 Dr. Asuncion is originally from the Detroit suburbs. After attending Wayne State University for her undergraduate work, she attended Michigan State’s College of Veterinary Medicine from which she graduated in 1990. She worked near Detroit in a small animal practice for a year, relocated to northwest Indiana in 1991, and worked in another small animal practice in Illinois for 26 years. She now looks forward to working with the Hobart Animal Clinic team and forming new bonds with the clients and their pets. She has a special interest in internal medicine but enjoys the variety of general practice. To her, seeing normal healthy puppies and kittens and making recommendations never gets old. She is married with two children, ages 16 and 18. Attending their various activities keeps her busy in her spare time, as does her family pet, Indy. Her other hobbies include gardening, bicycling, playing piano, and spending time with family.